Popular Education During the Middle Ages | Hugh Graham Ph.D.
St. John Baptist de La Salle was born in Rheims, France. He was known as the Father of Modern Pedagogy. He opened free schools for poor children, introducing new teaching methods. He organized the congregation called the Brothers of the Christian Schools, which made great contributions to popular education. Generations of schoolboys have been taught by the Christian Brothers, and their founder, St. John Baptist de la Salle, is familiar in their prayers and devotions. "Brothers Boys" are scattered all over the world and all of them have fond memories of their "De la Salle" days. 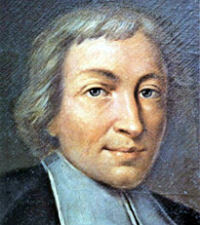 John Baptist de la Salle was born at Rheims in 1651, became a member of the cathedral chapter at Rheims when he was sixteen, and was ordained a priest in 1678. Soon after ordination he was put in charge of a girls' school, and in 1679 he met Adrian Nyel, a layman who wanted to open a school for boys. Two schools were started, and Canon de la Salle became interested in the work of education. He took an interest in the teachers, eventually invited them to live in his own house, and tried to train them in the educational system that was forming in his mind. This first group ultimately left, unable to grasp what the saint had in mind; others, however, joined him, and the beginnings of the Brothers of the Christian Schools were begun. Seeing a unique opportunity for good, Canon de la Salle resigned his canonry, gave his inheritance to the poor, and began to organize his teachers into a religious congregation. Soon, boys from his schools began to ask for admission to the Brothers, and the founder set up a juniorate to prepare them for their life as religious teachers. At the request of many pastors, he also set up a training school for teachers, first at Rheims, then at Paris, and finally at St.-Denis. Realizing that he was breaking entirely new ground in the education of the young, John Baptist de la Salle wrote books on his system of education, opened schools for tradesmen, and even founded a school for the nobility, at the request of King James of England. The congregation had a tumultuous history, and the setbacks that the founder had to face were many; but the work was begun, and he guided it with rare wisdom. In Lent of 1719, he grew weak, met with a serious accident, and died on Good Friday. He was canonized by Pope Leo XIII in 1900, and Pope Pius XII proclaimed him patron of schoolteachers. Patron: Educators; school principals; teachers. From the Catholic Culture library: Consecrated Persons And Their Mission In Schools by the Congregation for Catholic Education, Spectata Fides (On Christian Education) by Pope Leo XIII and Divini Illius Magistri (On Christian Education) by Pope Pius XI. The Station, at Rome, is in the church of St. Stephen on Monte Celio. This church of the great proto-martyr was chosen as the place where the faithful were to assemble on the Friday of Passion week.